Home Lifestyle Dining Out Are you “Imm” yet? 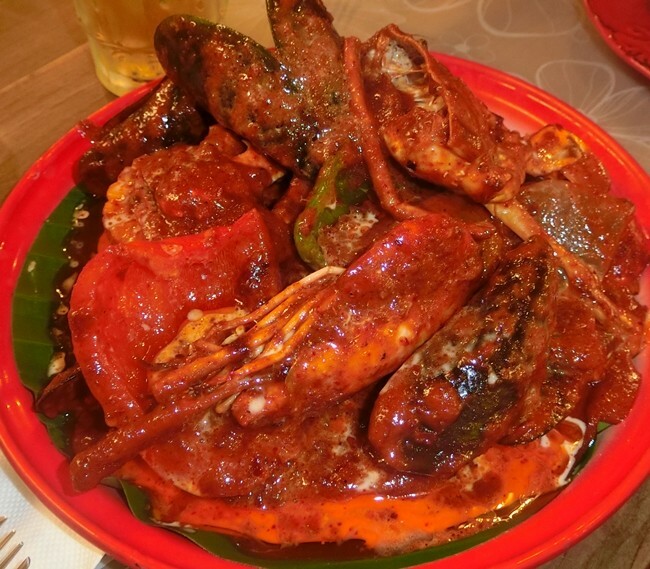 Imm’s pièce de résistance, the seafood hot plate doused with their secret recipe home-made sauce. 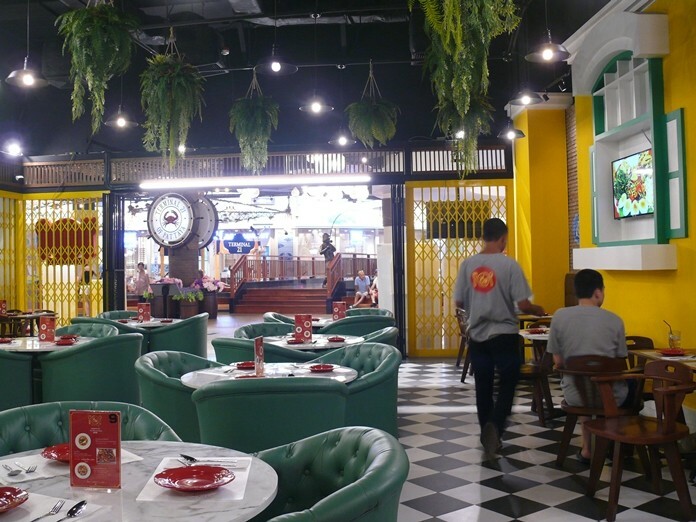 We took our first trip to the new Terminal 21 last week and restaurants are certainly strongly represented. However, there is only one restaurant where you’ll be “Imm”. Students of the Thai language will know that “Imm” stands for “full” or satiated, and Imm restaurant promises you will be Imm. Fried whiting fish with yellow ginger tastes as good as it looks. The Terminal 21, complete with two planes lined up on the forecourt, is a crowded shopping center, and for first timers finding any particular place can be a hassle. To help you find Imm, it is on the third floor across from the Golden Gate Bridge in the center. The restaurant itself is quite large, with murals depicting country restaurants from 100 years ago. I was very taken with the mural showing the old man making coffee and a group playing Mah Jong. Another mural has a noodle stall being looked after by a rather large lady. The security gates are modeled on the style you see in Bangkok’s China Town, and the more you look into it, the more it has Chinese influence. Along the back wall is a cocktail bar, and behind that is the spotless kitchen, which I inspected. Well padded high-backed chairs surround large tables and friendly service staff are ready to assist you with the ordering of food. The menu will surprise you. In glorious photographic Technicolor, you can see exactly what you are going to get. We ordered a number of dishes to try and get a handle on the cuisine. While perusing the menu we enjoyed a Heineken beer (B. 100), while other local beers are B.95. Appetizers are generally B. 150-180 and include fishcakes (father’s recipe) and fried pork with fish sauce. A couple of pages of plated (single) dishes (B. 150-220) offer items such as drunken spaghetti, pork or chicken steak (B. 220). 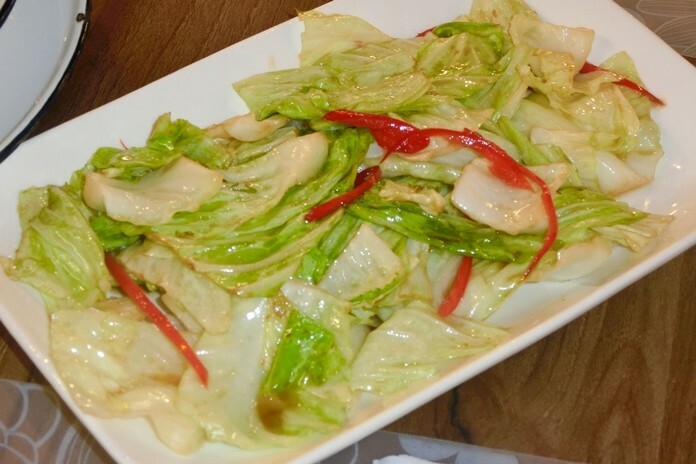 Traditional fried cabbage with fish sauce. Some spicy items follow in a tom yum soups and salads section. Traditional stir fries are mainly B. 160-280. Deep fries are next (B. 170-280) including squid fritters with garlic. Two pages of soups came next with a tom kha gai at the top, but very spicy dishes after that. Finally there are some noodle items (B. 80-100) with a traditional Chonburi style pork noodle soup, made to the original recipe. This is rounded up by some herb drinks (B. 65-75) and cocktails and beers. I began with the curried fish balls on bamboo skewers, not spicy and very more-ish. Another of the early dishes was a fried cabbage with fish sauce (B. 160). The main dish followed which was a hot plate seafood featuring crab, mussel, prawn and sweet corn all doused with their home-made sauce, which had a coconut flavor to it. 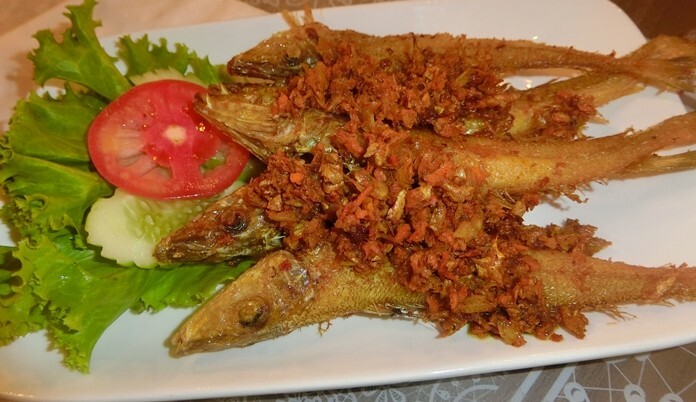 Another popular dish was the fried whiting fish with yellow ginger. This was followed by a green curry dried duck meat in traditional style (B. 280). However, the hot plate kept most of the Dining Out team quiet! Imm is a welcome addition to our local restaurants. Thai food with some genuine history behind it. We all tried the different dishes on order, with the Grilled sweet curry fish ball with herbs (B. 180) being my dish of the evening, whilst the others went for the sweet and sour hot seafood plate on an introductory special at B. 1,290 with enough for four. English is not the main language, but the staff will help you with choices. Imm, Terminal 21, 3rd floor (Golden Gate Bridge level), open every day from 11.00 am to 11.00 pm, plenty of parking. For reservations tel. 095 708 5502. Previous articleFree Porsche 911 GT2 RS. BYO Snorkel!